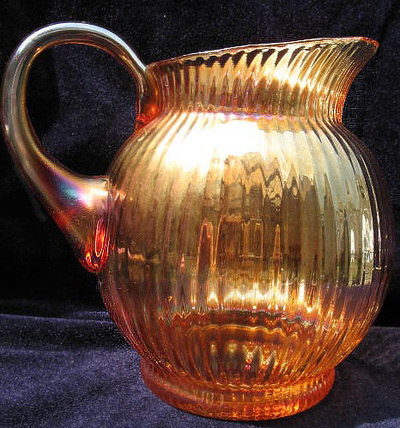 Czechoslovakia (now the Czech Republic) has a long history of glassmaking dating back to around the 13th. century, with an international reputation for quality craftsmanship, beauty and often innovative designs. 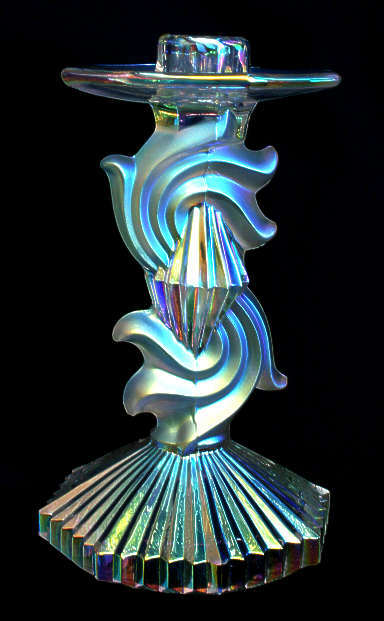 Given the popularity of Carnival Glass, it is not surprising that it was also made in Czechoslovakia. The two main makers are considered to be Inwald and Rindskopf, but other makers are being discovered, and our research is continuing: it has already caused surprises, such as our discovery of Rindskopf, and more recently, Libochovice. Most likely, more will follow. Circumstantial evidence, and a proven catalogue from Libochovice has given us an insight into the breathtaking items from this factory, founded in 1912 by Josef Feigl and Vladislav Móravek. Pictured above is an absolutely stunning candlestick, named (by us) Sublime Deco which we found in the Libochovice catalogue (number 1224). 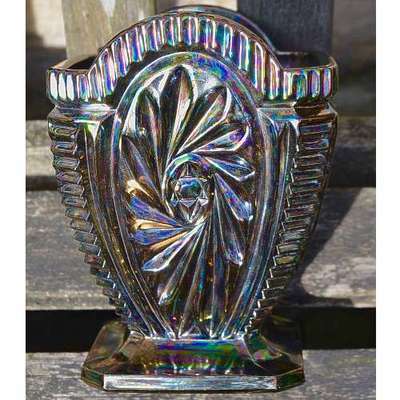 It is fully iridised on the frosted and un-frosted surfaces, giving an ethereal almost magical shimmer to the glass. TCHECOSLOVAQUIE is moulded on the base of the candlestick, dating it to the 1930s (pre WW2). 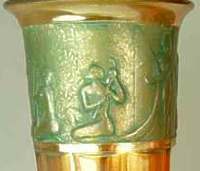 We contacted Libochovice (sadly they are no longer active now), and they confirmed that our candlestick was indeed their production from the 1930s. This particular model was a “really old design” that had not been in production for many years. They also said they had not used iridescence for a considerable time. 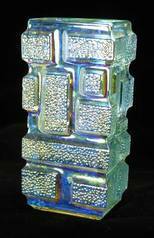 Czech glass researcher, Marcus Newhall, feels that the iridised items were likely made pre-privatisation (i.e. before 1939). A similar double candlestick and one with a daisy had remained in production for much longer than #1224, in fact the double stick was currently in production at the factory (in 2006) in part frosted finish and was illustrated on their website. 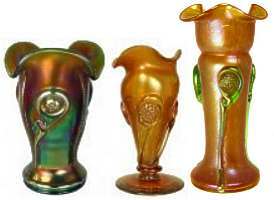 We also consider Libochovice to be the probable maker of several bulbous Carnival Glass vases - check them out here. Our study of a simple golden paper label (shown above) on a marigold jug surprised the Carnival world. 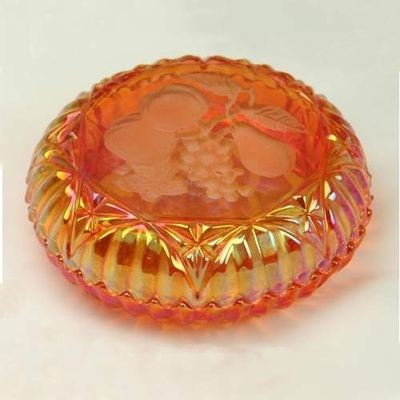 The label pointed us to Kralik, the famous Czech Art Glass maker. 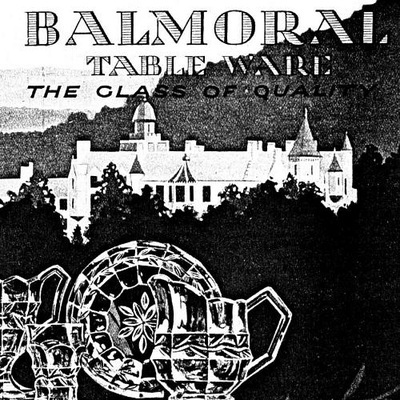 The lion holding an urn features on the trademark of Eleonorahutte (Eleonora Glassworks) "one of the most highly regarded of all Bohemian glassworks", and the word BOHEMIA added to the clues. The final decider was the letters WI KRA SO representing the name of the factory: Wilhelm Kralik Sohne. Read more about The Kralik Discovery. Eleonorahutte can be traced back to 1833-34 in southern Bohemia. In 1877 two Kralik brothers changed its name to Wilhelm Kralik Sohne (Wilhelm Kralik's Sons). 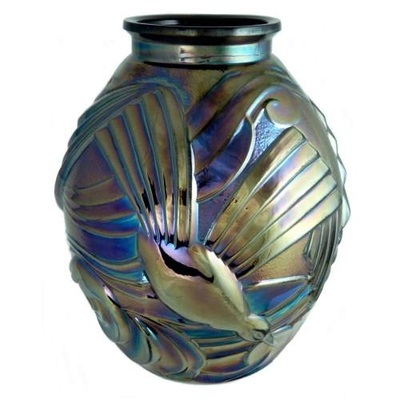 Their output covered the entire range of Art Nouveau designs: iridized, painted, hot decorated, cut and engraved. In 1946 the company was nationalised and merged with Cesky Kristal, which became part of Cristalex. In 1995 the glassworks at Eleonora was closed down. 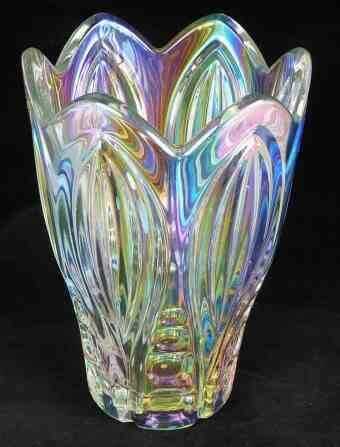 Did Kralik influence Harry Northwood's design of the Tornado vase? 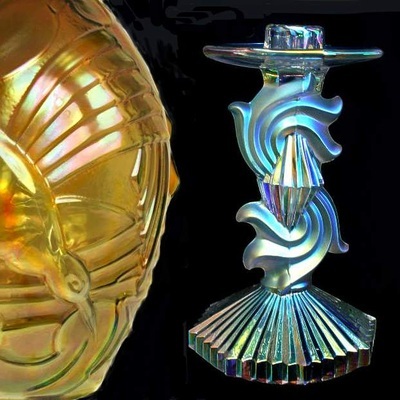 Catalogue evidence proves that Carnival Glass was made by Reich. 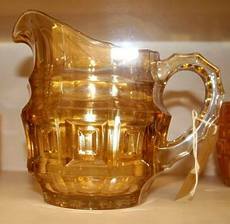 The picture shown above is a Plantagenet water pitcher in marigold (it is part of the Notley-Lerpiniere collection of Carnival Glass). Read and See More about these other Czech Makers - click on any image. 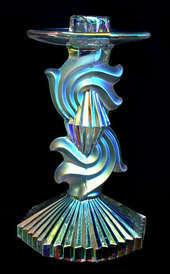 Did Kralik inspire Tornado vases?